Fed Chair Janet Yellen sketched a cautious and uncertain view of the economy in testimony before lawmakers in Washington. (Bloomberg) –Three weeks ago, Federal Reserve officials sounded like they needed a reason not to hike interest rates soon. Now, they’re in search of a reason to consider any change in policy. “Unless something unexpectedly positive happens, they’re likely on hold for the next couple of meetings,” said Carl Tannenbaum, chief economist at Northern Trust Corp. in Chicago. Fed Chair Janet Yellen sketched a cautious and uncertain view of the economy in testimony before lawmakers in Washington Tuesday. After her remarks, Tannenbaum was among several economists who said they believe Yellen is among the six Fed officials who last week predicted just one rate increase this year. And that others on the Federal Open Market Committee may soon follow her lead. If the chair was one of the officials who forecast a single rate increase, that would mean she stepped below the median forecast of the 17 participants published June 15, which was for two hikes. That would be unusual because Fed chairs typically lead from the center of the committee. They can’t do that if they are outliers, said Laurence Meyer, a former Fed governor who now runs a policy analysis firm in Washington that bears his name. 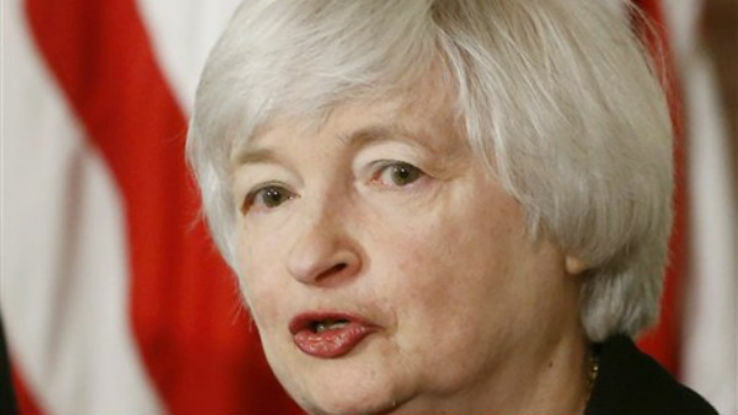 Yellen can lead the committee to a lower consensus if she thinks that’s the direction it is headed, he said. Nine officials in June expected two rate increases this year, so only three of them would have to lower their forecast for the median to slip to a single move. “My view, with very strong conviction: She is among the six at one” hike for 2016, Meyer said, referring to the Fed’s quarterly forecasts for the appropriate pace of rate increases. The median of these anonymous quarterly projections, displayed in a so-called dot plot, was halved in March from the four 2016 hikes predicted in December. Leading up to the release of the May jobs report on June 3, a number of Fed officials made an effort to raise expectations in financial markets for a move either this month or in July, arguing the central bank risked stoking asset bubbles if it waited too long to tighten policy. Another part of their argument was that consumer demand, helped by lower oil prices, would keep supporting growth while exports, business investment and other parts of the economy were uncertain or weak. The case for a strong consumer took a blow, however, when the Labor Department reported that employers in May created a disappointing 38,000 new jobs — fewer than in any month since September 2010. “It seems pretty clear the Fed’s confidence was pretty badly shaken by those recent numbers,” said Ward McCarthy, chief financial economist at Jefferies LLC in New York, who also pegged Yellen as likely favoring one hike this year. “The latest readings on the labor market and the weak pace of investment illustrate one downside risk: that domestic demand might falter,” Yellen said Tuesday. A strong jobs report for June could convince some policy makers that May was something of an anomaly. But Yellen on Tuesday also highlighted worries over longer-term problems in the U.S. economy that are unlikely to reverse any time soon. Those “headwinds,” like weak productivity growth or tepid business investment, may only slowly fade over time, she said. In that context, there would be little need to raise interest rates quickly so long as inflation remains around the Fed’s 2 percent goal. “We cannot rule out the possibility expressed by some prominent economists that the slow productivity growth seen in recent years will continue into the future,” she said. Productivity, a measure of labor’s output per hour worked, has grown at historically low levels since the financial crisis, a factor in the economy’s overall weak performance. Jonathan Wright, an economics professor at Johns Hopkins University in Baltimore, said that while the dots include all 17 FOMC participants, only 10 vote on policy. His guess is that as many as four or five of the officials who forecast one hike this year are voting members.